If you are into tinkering with Raspberry Pi's, this seems like a good deal. Price includes VAT and free standard UK delivery (3-5 working days). 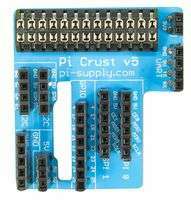 I'm a breakout board for the Raspberry Pi. I make it easy to connect electronics. I'm compact. Really compact. I add less than 2mm to the height of your Raspberry Pi and 1mm to to width. I have female headers - you can poke jumpers right in. I have lots of GND and 5V pins - you need those a lot. I'm easy to make. A good project to learn to solder with. I'm fully open source hardware. Fork me, tweak me, share me. Suppose it's useful if you are inept with a soldering iron. This does require soldering, but at the most basic of levels. I would hazard a guess that most Raspberry Pi enthusiasts don't mind a bit of soldering. If they haven't tried soldering before, give it bash. Here is a handy comic guide for the newbies. Can we take a moment to delve in the suggestive vocabulary? This does require soldering, but at the most basic of levels. I would …This does require soldering, but at the most basic of levels. I would hazard a guess that most Raspberry Pi enthusiasts don't mind a bit of soldering. If they haven't tried soldering before, give it bash. Here is a handy comic guide for the newbies. Thought it just clipped over the existing pins, my bad for not reading. It's not about soldering but prototyping, these breakout boards are great for that. Clearly when it's all finalised you can go and do a proper soldering job. It's not about soldering but prototyping, these breakout boards are great …It's not about soldering but prototyping, these breakout boards are great for that.Clearly when it's all finalised you can go and do a proper soldering job. Of course, just wanted to make clear that this board requires soldering in order to use it (unlike some other boards which don't). Look, it's just for those of us who think we're doing proper electronics.